You can't go wrong with either of Laurelwood's fresh hop ales this year -- the fresh, green flavor comes through clearly in both of them. Sunday I had a pint of Hop Bale Pale at the 51st and Sandy location, and brought home a growler of that and a growler of Fresh Nugs from the 40th and Sandy Laurelwood Pizza Company. The Hop Bale is exactly what I'm looking for this time of year: a light, almost honey-sweet beer, with the herbal hop aroma that only the wet hops impart. This nudges Bridgeport out of first place for me in 2008, though of course there are a lot more beers yet to try. It's the beer on the left in the picture. On the right is a glass of Fresh Nugs. It's much hoppier than the Hop Bale -- Laurelwood's blog describes it as "mondo super good times hoppy" -- but it's still unmistakably fresh-hopped. The bitterness lasts and lasts, which is a good thing. 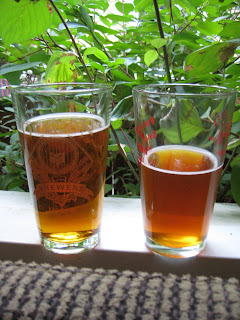 Comparing the two beers in the picture, you can see that the Nugs is cloudier and a little darker -- more vitamins I guess. If IBUs are your thing, you might prefer it, but my vote goes to the Hop Bale, which gets the flavor exactly right. Last year I thought Laurelwood's fresh-hop brew suffered from the same problem as Bridgeport's: too much regular old dry-hop flavor. Both breweries corrected that this year. I'm a happy camper.